So as of January 26th I’m officially 24 and for the Burkinabe it is now even more absurd that I don’t have a husband and a couple children. Everyday it is a topic of discussion. Seriously, everyday. All my coworkers plus random Burkinabe tell me I need to marry a Burkinabe and live here forever (don’t worry Dad its not going to happen) plus my mamma who only speaks Moore, which I am slowly understanding more and more of, tells me it’s time for me to have kids. How do I know that? Well she grabs her breasts, indicating breastfeeding and then does a motion of putting a baby on her back, which is how they carry their children here. So I pick up on what she is trying to tell me. I spent my birthday in Ouaga with all the other volunteers in my sector (GEE). We were having our IST (in service training). IST comes after our first 3 months at site; it’s more condensed and hands on training then PST/stage (pre service training). Being that we have been at site for a few months it was an opportunity for all of us to share our site experiences, exchange ideas, and let others know what has worked for us and what hasn’t. We went over all different kinds of topics including, school gardens, soap making, building community libraries with the help of an NGO (non governmental organization), English clubs, teaching critical thinking, violence in the classroom and many others. As well as getting moto privileges! Bye, bye biking in 100+ degree weather! I got a little off track so getting back to my birthday. It fell on the last day of counterpart workshop so I was lucky enough to spend it with all of my friends from GEE and with my counterpart. That night we ordered pizza from an American woman who is a missionary here and later went to a bar in Ouaga that has pool and beer on tap. It’s owned by a French man so it’s not like all the other bars here. It was exactly what I wanted/needed, beer and pizza. Very American. IST continued until the 29th and after that I made a quick stop to see a new neighbor and made it back to site at the beginning of February. February didn’t start off too well for me because of the heartbreak on the 6th. A weekend in Ouaga to see my Steelers lose to the Packers was not the weekend I wanted. Although it was nice to see the game. Obviously I would have preferred a win or to be able to watch the game back in the states but oh well I have plenty more years ahead of me to do that. So now its Cubbie season and ill get to focus on that, but if they make it to the World Series I will most definitely be on the first flight back to Chicago! Other than the tough loss at the beginning of the month February has been a good month, my village has been keeping me extremely busy. Looking at my calendar I have had something everyday which is great, the worst thing in village is to have nothing to do. Those days with nothing to do I get a lot of reading done (aka all 3 Chelsea Handler books in 2 days). -I’ve been teaching groups of women how to make liquid soap. It’s a great income generating activity for the women. It is really cheap and easy to make and sells VERY well. Plus getting more soap out in a country where they do everything with their hands, for example hands being used as toilet paper as well as hands being used as an eating utensil (different hands though, they do absolutely nothing with their left hand because it is used to wipe). -I have started a study group for the CM2 class (5th/6th grade) in Barkuitenga to help them prepare for a test the will have to take in June to move on to the Lycee (HS). We meet for 2 hours twice a week and go over anything they have had difficulty with during the week. This group is on top of me sitting in on classes’ everyday at Koassanga and Barkuitenga. -At these two schools we have decided to plant 100+ trees of Moringa and other local variations of trees. I think I mentioned this before but moringa leaves are a great source of nutrition and I plan on having the cooks for the canteen add this to the rice and beans the students have for lunch everyday. The other trees also can be used to generate income by using their leaves to make oil to sell or add to sauces for meals, and of course all of the trees give the school courtyard much needed shade from the overwhelming sun. -I have begun working with one of the English teachers in Ziniare. I go with him to his 4eme class (8th/9th grade, but the kids are a bit older 16+) and help with his 50+ students. Mostly I help with pronunciation and also serve as the answer lady for all things American aka “Do women in America hunt and fish?” or “Who chooses to get married the man or the women?” For the Burkinabe women don’t really get a choice in marriage the man chooses his wife and that’s that. So the boys didn’t like it to much when I told them in America it is up to the couple to decide if they want to get married and that it’s usually the woman who gets to say yes to a proposal. And when I told them that even though it’s not extremely popular some men even choose to stay home to take care of the children and do the cooking there was an uproar and it took a few minutes to get the students back on track. -A few times a week I do one-on-one English tutoring with local lycee kids. They will come by my house in the evening and I will help them with pronunciation and comprehension. It’s actually a lesson for me too because it helps me with my French vocab. On top of all this I am on the Camp GLOW committee in Kaya. I have another meeting with volunteers this weekend. After the last meeting I went around to 3 of the Lycee’s here in Ziniare to talk to the principals and ask if the would choose 8 students to participate, 2 girls in 5eme and 6eme and 2 boys in 5eme and 6eme. 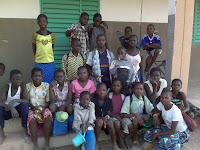 I also had to ask for money to pay for their transport which is around 3,000 CFA ($6) roundtrip per student. So far things are going well. We are still somewhat in the early stages of planning and things here work slowly but so far so good. I will be sure to write more about it later once I get more details and also check out my post before this for a video on the camp that was held by other PCV’s. I hope you all have had a great winter, some of you may hate this but I am very jealous of the huge snowstorm that hit the Midwest. I would do anything for snow right now. Every day just gets hotter and hotter, April is supposed to be the worst and I’m scared to death! I’m not sure of how many of you saw the report on the Peace Corps on 20/20 but frankly I was personally very upset with how the report decided to describe Peace Corps. I feel a deep sadness for all of the young women who had such horrible things happen to them and cannot imagine what they have been through. With that being said each country is run by very different people and are not at all the same. I have complete confidence in the safety and security personal that work at the office here in Burkina. I have never felt unsafe and I know if I did they would take action immediately. Our safety has always been a priority and I have never doubted the lengths our staff would go to keep us safe. I hate that Peace Corps was shown in such a bad light on the brink of their 50th anniversary. I hope that you will all recognize the great work volunteers have done in the past 50 years and the work they will continue to do in the future.